Winter is fast approaching, and now is the time to decide if you’ll be doing the plowing yourself or if you’ll hire a professional contractor to do it. If you’re leaning toward doing it yourself, ask yourself these seven questions before you decide to take on this important project. #1. Do you have a truck and a plow? This is kind of a given. Having a truck, mount, and plow is essential if you plan to go it alone. If you don’t have the proper equipment to get the job done, you will have to leave it to someone else. #2. Can you distribute de-icing material? Plowing is only one aspect of snow and ice management. It’s not enough to simply clear the snow. Managing the ice with well-distributed ice melt is vital to minimizing proper safety standards. #3. Can you properly maintain your sidewalks? Failure to clear sidewalks and pedestrian walkways can lead to trouble. Poor conditions can easily cause an increase in slip and fall accidents, so if you choose the DIY route, make sure you can clear sidewalks early and often to avoid any issues. 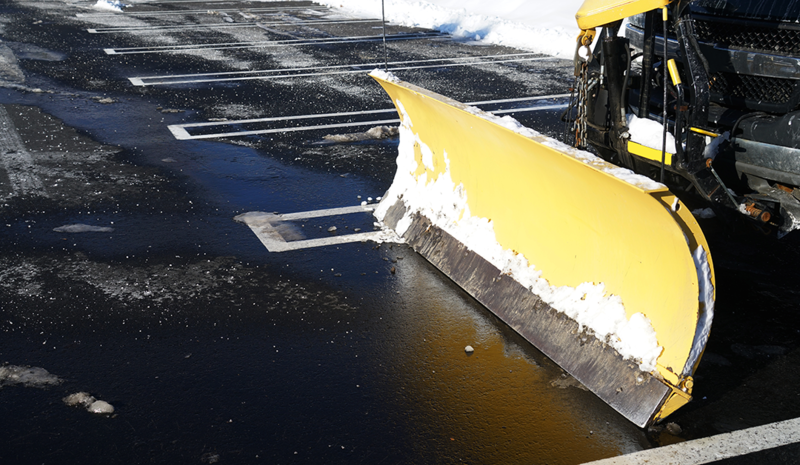 Additionally, there are local ordinances regarding walkway snow removal that must be followed. #4. Can you manage plowing during and after a storm, day, and night? The weather can be unpredictable and a storm can strike at any time. Are you prepared to go out and plow during a storm? Doing it all yourself means you have to monitor the weather, plan to perform preventative maintenance, and quickly plow and de-ice following the storm. #5. What are your labor costs (including the cost of dropping other work to plow)? Cost savings is often the top reason why people decide to manage plowing and de-icing themselves. But when you factor in vehicle and equipment wear and tear, increased insurance costs, and the opportunity cost of stepping away from your other work responsibilities to plow, hiring a professional may be more cost effective. #6. If someone slips and falls on your property, do you have the proper insurance? If you choose to do your own plowing, just know that you’re also assuming responsibility for the safety of others. Having the proper insurance just in case someone falls and gets injured is an added protection for you, but also comes with an added cost. #7. Do you have a backup plan in case there’s equipment failure? This feels like déjà vu (see question #1), but having spare equipment just in case isn’t something most DIY-ers consider. If your truck broke down or your plow malfunctioned, what would you do? Having a contingency plan is essential, but you could eliminate that added stress if you employed a professional to the do the job. Deciding whether to hire a pro or do it yourself is a big decision that should not be made lightly. Keep in mind that by going it alone, you’re assuming increased liability in addition to all of your regular responsibilities. Call and track snow removal in real time.